10.30am-11.00am: Assessment of gaming disorder and PUI – what are the best scales? Chairs: Naomi A. Fineberg. Hertfordshire Partnership University NHS Trust and University of Hertfordshire, Welwyn Garden City, UK. Joseph Zohar. Chaim Sheba Medical Center, Tel Aviv University, Israel. 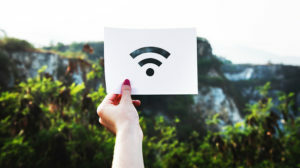 17.15- 18.00 Hooked on WiFi – my lived experience. Speaker: Person with lived experience, with Susana Jiménez-Murcia as interviewer. 19:00-20:00: Treating Problematic Usage of the Internet- what might work? 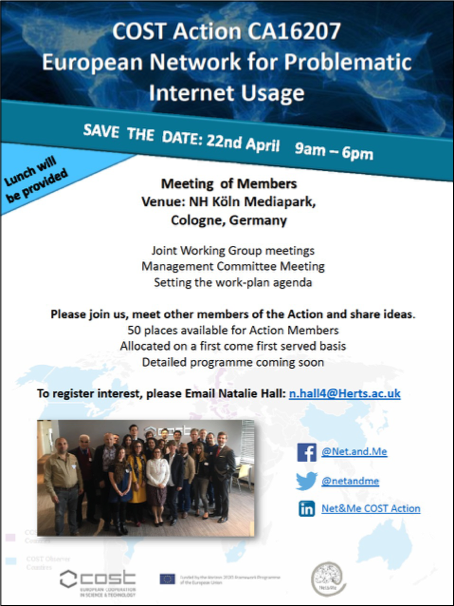 This Masterclass was streamed online on 29thMarch at the University of Hertfordshire as part of an activity of the Internet & Me COST funded project. By looking at the recording of this event, you will learn more about the neurobiological mechanisms of behavioural addictions as well as the latest trends in Internet, Eating Disorders, Gambling and Exercise addictions. Introduction to the concept of behavioural addiction. Gambling Disorder in the UK: an overview of the illness and its treatment. The Dark side of Appearance: the prevalence of Exercise Addiction in fitness clubs. Physiological and clinical aspects of Eating Disorders. Internet Addiction and Hikikomori: a new psychopathological scenario. Please join us, meet other members of the Action and share ideas.